For a while I've been on the trail of a saying usually attributed to Winston Churchill: "This is the sort of arrant nonsense up with which I will not put" (or some variation thereof). Typically the line appears in an anecdote where an officious clerk or editor tries to correct something Churchill has written by "fixing" his trailing prepositions, and Churchill then scribbles the famous comment in the margin of the revised text. I had previously found this anecdote circulating without reference to Churchill as early as 1942, with the first attributions to Churchill appearing in various forms in 1948. (A version in Sir Ernest Gowers' Plain Words that year played a large part in the story's dissemination.) Now I think I've found the original attribution to Churchill, though it differs in some important ways from later retellings. Let's suppose that the correspondent's story isn't completely apocryphal and that Churchill actually made such an annotation. My suspicion is that Churchill saw the 1942 version appearing in the Strand Magazine (to which he frequently contributed) and created his own variation on the theme. If he wrote "with which I will not put up," then the line would still retain some of the derisive flavor of the original anecdote, since there is still at least one inappropriately fronted preposition, with. But the version in the New York Times does not feature any preposition-fronting, thus defeating the purpose of the joke (which ridicules the convoluted steps that bad writers take to avoid sentence-final prepositions). Presaging modern spellchecker-generated errors, someone at the Times apparently committed an editorial hypercorrection. 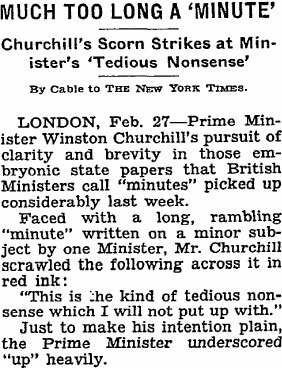 I would surmise that the offending editor thought that the point of the squib was merely Churchill's strong castigation of the "tedious nonsense" in ministerial minutes. The relative clause was seen as secondary, rather than the entire point of the remark, and thus was subject to redaction. The final sentence, mentioning the underscoring of up ("just to make his intention plain," in the Times version), then appears to be nothing more than added emphasis on Churchill's part, rather than driving home the witticism. "Things About Which Women Are Talking"
Women are passing along a bon mot in the current issue of Counter-Point. Winston Churchill, after laboring through the circumlocution and trailing prepositions of a governmental report, exploded, "This is the sort of stilted English up with which I will not put." Latest Churchill story going the rounds has to do with a stuffy young Foreign Office secretary who had the job of "vetting" the then Prime Minister's magnificent speeches. The young man disliked the P.M.'s habit of ending sentences with prepositions and corrected such sentences whenever he found them. Finally, Mr. Churchill had enough of this! So he recorrected his own speech and sent it back to the Foreign Office with a notation in red ink, "This is the kind of pedantic nonsense up with which I will not put!" In this telling, the anecdote resembles the original 1942 version in the Strand Magazine where the line is credited to an unnamed writer. 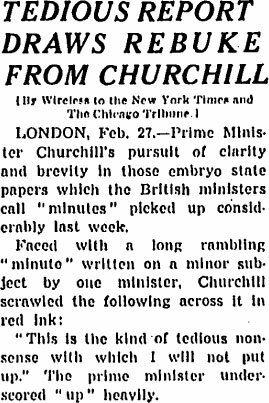 Gone is Churchill's opprobrium toward the "tedious nonsense" of ministerial minutes; his ire is directed instead toward a would-be improver of his own prose (though Churchill's "red ink" remains constant). It would seem, then, that the story that inspired Churchill to make his purported 1944 annotation in the first place came to be credited to Churchill himself by 1946. And this would be the version that would become more firmly linked to Churchill in later years, through Gowers' Plain Words and other promulgators of the story. I can't help thinking that Churchill would have been quite happy to get credit for the original anecdote, since it was more memorable (and less confusing to editors!) than his actual comment of 1944.